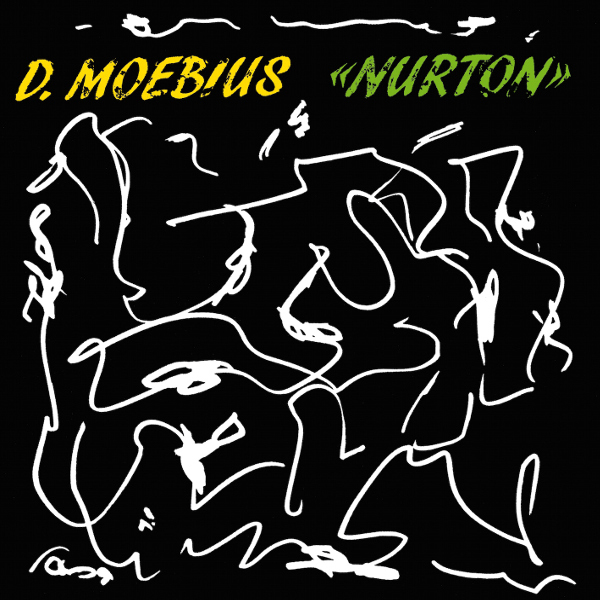 Seven years after Blotch, Moebius released his next solo album, Nurton. On this second album of his late period work, he explored new directions by searching for flaws and using them as creative impulses. Each of the fourteen tracks has the same basic structure, an initial rhythmic loop with additional layers of sound, but there the similarities stop. Every track is different in sound and mood. Eschewing sonic imitations of instruments or song structures, Moebius continued to explore new sounds, modulated noise, and interactions to harness the flaws in his equipment and share his discoveries. Moebius’ loops are ingenious and his layering of additional sounds and elements does not overpower, but instead imperceptibly creates listenable and enjoyable atmospheres. Nurton has a bolder and harsher sound than Blotch. There are more tracks of shorter duration and greater diversity, and one or two of the tracks harken back to his Cluster days. I also find the cover art fascinating. The random squiggles embody Moebius’ electronic experiments. The closing track, “Das Letzte,” has a completely different atmosphere. This is a quieter and gentler Moebius and characterizes the music on his following solo releases. It is refreshing to experience the experimentation and continued innovation of a musician approaching his 70s when many of his peers have either mellowed out or stopped recording entirely.